MOUNT GILEAD — Amber was a bit unsettled Monday afternoon. 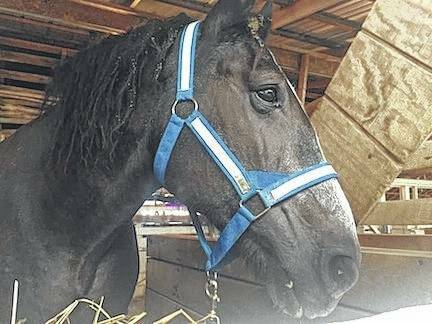 The 24-year-old black draft horse was being tended to by Jamie Smith of Fredericktown. Eight days of food, fun and 4-H exhibits began under cloudy skies as the 167th Morrow County Fair opened. For the most part, Smith says, Amber has it easy. “We only work her the three show days — Tuesday, Thursday and Saturday,” she said. Those are cart classes, halter classes and Fun Day. Smith and her husband stay at the fairgrounds all week; they brought food in a freezer and have a mattress set up behind Amber’s stall in the horse barn. Amber goes through two bales of hay for food and another half bale for bedding. Across the grounds, pacers and trotters stepped off in the first of two days of harness racing, a fair staple on the half-mile oval. Racing began there in 1868. Vendors kept an eye on the sky, hoping the rain held off, as they opened their stands. Donna Swazey, the cook at KG Concessions, prepared gyros for the business, owned by Virginia Greer. “Those are our big seller, along with the chili cheese fries,” Swazey said. James and Jacob Monroe roamed the grounds looking for friends. The Mount Gilead brothers had no trouble naming their favorite things at the fair. The fair concludes Labor Day with the open demolition derby at 4:30 p.m.
Gate admission is $6 and season passes are $25. More information online at morrowcountyfair.org. Junior Fair board member Emma Burchett and Molly Clapper help to corral a hog during the first day of the Morrow County Fair. 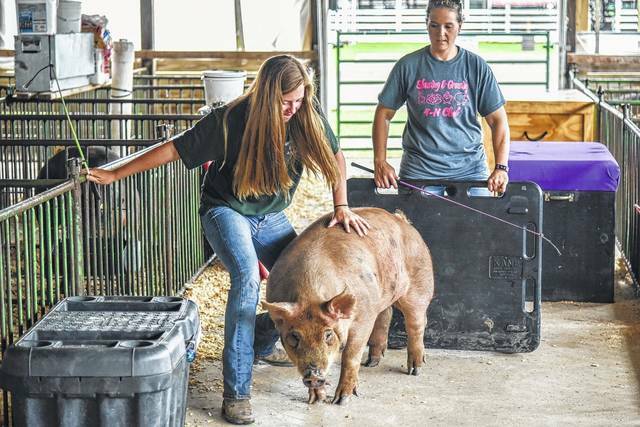 https://www.morrowcountysentinel.com/wp-content/uploads/sites/29/2017/08/web1_Hog1A.jpgJunior Fair board member Emma Burchett and Molly Clapper help to corral a hog during the first day of the Morrow County Fair. Amber, a 24-year-old draft horse, stands in the horse barn Monday afternoon. https://www.morrowcountysentinel.com/wp-content/uploads/sites/29/2017/08/web1_Amber.jpgAmber, a 24-year-old draft horse, stands in the horse barn Monday afternoon.